Imli ki chutney is a sweet and sour Indian sauce which is used as a dip with savory snacks like samosa, pakora or kachori. It is also a must to pour over dahi bhallas. It is very easy to make and tastes absolutely lip smacking. You will end up licking your lips and asking for more. 1. Soak imli in 2 cups of hot water for 20-25 minutes. Mash imli and strain through a seive. Remove seeds, fiber and husk. Again pour some hot water on the remaining imli and extract all the juice by mashing well and straining. 2. Boil this juice in a pan and add all the spices, salt and gur. 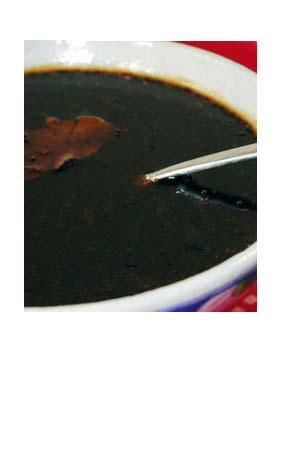 Bring to a boil, then simmer on a low heat till imli ki chutney thickens and you get the desired sauce like consistency.